We all know how important it is in today’s world to have adequate money and savings. It’s important to save as much as possible and invest the saved amount at the right places so that your savings grow at a healthy rate. In this article, I’ll be mentioning 3 fantasctico tips which will help you save some extra money every month. This is a very good way to save some fixed amount of money every month compulsorily. Once you open a recurring deposit account in your bank, you can give standing instructions to directly deduct the fixed monthly instalment from your savings account and add it to your RD account. RD helps you to save money compulsorily every month as well as get some interest on your savings. You can start a RD account in any reputed banks, co-operative societies or even post offices. Make sure you check and compare their interest rates and then make a decision. This tip will save you considerable amount of money. You need to make a plan of all the groceries and daily essential items you require for a week or a month and buy it at one go. Advantages are many for this. Firstly, when you buy items at one go you stop spending on unnecessary things. You will also save time and money since your trips to supermarkets/malls will be reduced significantly. Best part, make use of cashback offers provided by credit card companies, mobile wallets etc. For example- Mobikwik is currently giving around 10% cashback on making payments at Big Bazaar via your mobikwik wallet. Check out such offers. This will help you save lot of money. All of us tend to ignore this important aspect. Electricity bills consumer a lot of money every month. Try reducing your electricity expenses. Turn off devices when not in use. Replace existing devices with energy saving ones if possible. Use LED bulbs wherever possible. They consume very less energy as compared to normal bulbs or even CFL bulbs. You can also get discounts and cashback if you pay your electricity bills online using mobile wallets like Paytm & Freecharge. Even if you save say Rs.1000-2000 every month on your electricity bills that would be great. Remember two things- drops make an ocean & every penny counts! That’s it guys. You will already know the conventional tips to save extra money every month. I am not repeating those. 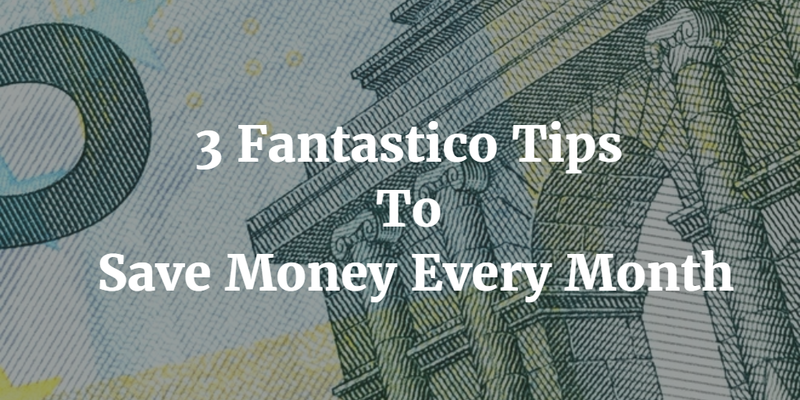 However, I am 100% confident that using the 3 fantastico tips I mentioned in this post will definitely help you save money. If you are aware of any not-so-common tips to save extra money every month, share it via comment box below.